Tasty Kabob is not the first Persian restaurant to open in El Paso, but it is reflective of the fact that a larger variety of ethnic food is available than ever before. Moreover, the food I have eaten here has been genuinely good, and seems to be a worthy example of the cuisine of Iran. Tasty Kabob is small and possibly gets most of its business from take-out orders. There are not a lot of items on the menu, a fact that I think may change once Persian cuisine gets “discovered” by the masses. For now the kabobs seem to be quite popular, and the other items are there for those who care to be more adventurous. 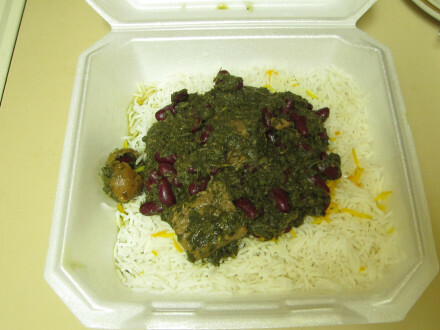 Ghorme Sabzi is a traditional Persian dish that is on Tasty Kabob’s menu, and is offered at a fairly good price. The best way I could describe this dish is that it tastes like parsley, but the flavor becomes very complex with the other ingredients that are mixed in. There is the fruity flavor of sundried limes, along with tender chunks of beef and kidney beans made with the traditional recipe. I have tried this dish at three different restaurants (one was a former Persian restaurant in El Paso), and the one here is the one I thought was best. I think it is because while all ghorme sabzi dishes have the parsley, beef, and kidney bean flavors, Tasty Kabob seems to add a different dimension of flavor (probably mostly from limes). I am not an expert on this dish, but I do know that the one here is quite good. Kabobs are the most prominent feature of the menu, but there is also a large selection of Middle Eastern appetizers and Persian entrees. I tend to think of kabobs as a snack, but many of the ones here are quite elaborate meals served with rice, salad, and vegetables. They also have sandwiches, though, for an inexpensive lunch or dinner. There is a special meal on the menu called the “Tour of Persia” serving 3 to 4 people and offering several Persian entrees including a bone-in chicken kabob plate. To me the ambiance of this small restaurant does not quite match the food, but discounting the fact that they do not have belly dancers or some of the features found at other Middle Eastern restaurants in the city, I really think this is one of the best places to go for traditional food. I have only tried one of the menu items but I highly recommend it. The Basmati Rice had the same high quality as the main dish. I should not have to mention this as one of the reasons to come to Tasty Kabob except for the fact that not all restaurants match up to this one in the rice that they serve. Hours: Closed Sun. evening and Tue. To truly enjoy Singapore Café I think customers need to place greater importance on fresh ingredients, healthy eating, and a home cooking style of food than on truly authentic Thai cooking. I call it “Thai fusion” because many of the best dishes are ones created by Becky, the owner and chef, rather than the traditional Thai dishes that are on the menu. Even the name of the restaurant implies that she borrows recipes from Singapore, Malaysia, and surrounding countries. Singapore Café has fulfilled a great need in my life by providing vegetarian dishes at a time when that was the only type of food I was eating, preparing them with individual care and making them flavorful enough so that a meatless meal could be genuinely satisfying. I have enjoyed the food a lot more by asking for fish sauce and other normal Thai flavorings to be included that are not necessarily vegetarian, but Singapore Café has a greater variety of tofu dishes than I can find anywhere else in town. True vegetarians have always flocked to Singapore, though, knowing that any dietary request made here will be honored, and that it will be made as flavorful as possible. Becky makes sure the food is cooked to customer’s specifications. I cannot say for sure that the food at Singapore Café is inauthentic or unlike the food that would be found in Thailand. I do know, though, that patrons are not supplied a tray of Thai style condiments as they are at many other Thai restaurants. I definitely do not taste some of the flavors here that I have found in Pacific Northwest Thai restaurants, and the menu offers quite a small selection compared to most Thai restaurants. Instead of ordering the traditional Thai dishes, though, I have found that some of Becky’s creations are quite good, and in fact many of them seem to be “one of a kind.” Some of the best sauces also seem to be on the Malaysian and Singapore style dishes. The Southwest in general and El Paso in particular does not do vegetarian food very well, thus I usually think meat dishes are the best choices. Singapore Café, though, is one of the few restaurants that serves good quality tofu, but more importantly makes tofu dishes that are balanced and provide a satisfying meal. I have tried some of the meat dishes at Singapore, but most of the time I go back to the vegetarian dishes because this is one of the few places that does them really well (although I usually make sure to ask that fish sauce be added). Over the years one of the entrées I have enjoyed very much at Singapore Café has been Veggie Ginger Tofu, although I would not rate it the same as many of the ginger dishes served in the Seattle area and other cities. The one here includes tofu, ginger, mushrooms, peanuts, and snow peas as the primary ingredients, set on a bed of lettuce that I only consume if the rest of the plate is not sufficiently filling. I find the dish to be sickly sweet and off balance in flavor, but still the vegetables and tofu are of good quality and this is something I do not mind ordering. It is much better with fish sauce, which does not come in the vegetarian version, but can be requested. 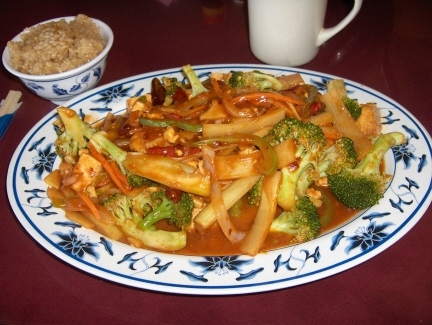 Yu Sang Broccoli is generally good in its vegetarian version, but can also be ordered with meat. Becky describes this as a “Chinese ex-patriot” dish, and it probably came from the large Chinese population in Thailand that mixed their own recipes with the local ingredients. To me this is one of the few dishes at Singapore Café that does not taste too sweet or “Americanized;” rather it has a good balance of flavors. It is surprisingly spicy, though, considering the lack of spice found in many of the other dishes. Curry dishes are the ones that have been the most disappointing to me. They do not seem to have the rich and full flavors I have experienced elsewhere, and in this case I would like them to be more “authentic” (as I have experienced them in other restaurants). 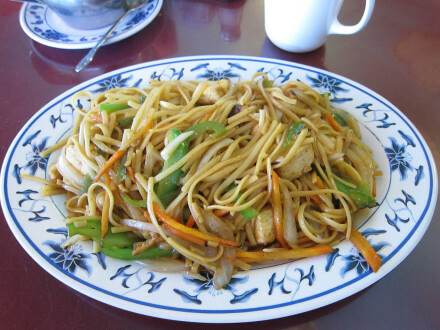 A very good vegetarian choice is the Veggie Mi Goreng, consisting of noodles with tofu and vegetables. I think this is usually considered to be a Malaysian dish, and over the years has been one of my favorites at Singapore Café. It is not one of the dishes that taste “sweet,” although it seems to have a sweet and sour contrast done in a traditional Asian way. Several soups are served as entrées, but many of them are not as satisfying to me as at other Thai restaurants. The Tom Kha Gai (with coconut), however, has frequently been better than at many other places. Tom Yum is a spicy soup with pineapple and tomato, flavored with lemongrass. 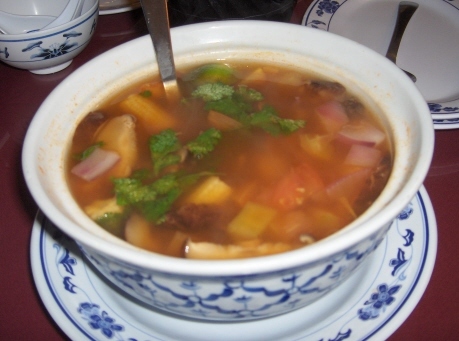 This is similar to Vietnamese style sweet and sour soup, but is rather different from the versions of tom yum I have found at other Thai restaurants. I liked the chicken version better than the one with shrimp, even though the opposite is true with some other dishes. Some of the best dishes at Singapore have been specials that are not always available including Mango Tofu that may not be great when compared to Thai food available in other cities, but is one of the more delicious and healthy dishes available in El Paso. This is an example of the food at Singapore that may not be the best that can be found anywhere, but is certainly enjoyable (or at least I have found it to be so). 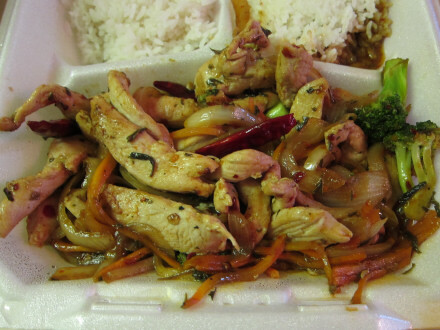 The Green Tea Chicken started out as a special but was added to the menu in 2005. This is a spicy dish served in a bowl on top of rice with broccoli and other vegetables. When Becky served it as a special I liked it so much I made it a point to tell her, and perhaps this was one of the reasons it was added to the menu (OK, maybe this wasn’t the reason). There is also a tofu version but I think the chicken has a better flavor. Lunch specials come with a delicious, slightly tomato flavored soup that I think is better than the soups found at just about any Chinese restaurant in the city. 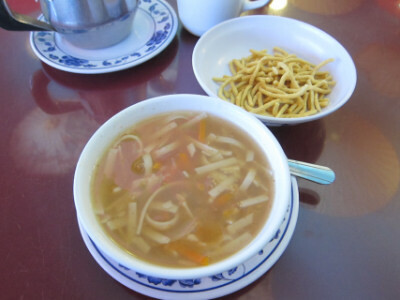 The crispy noodles that come with it are excellent, and even if the choices for luncheon specials is limited the soup is always good. I am sure this is a big factor for the restaurant’s popularity at lunch time. The lunch menu comes with about six choices, and besides the soup includes lumpia. The lumpia, a small fried spring roll, has meat inside, and most of the menu items are meat dishes. Two of the lunch specials can be made vegetarian (pad thai and kao pad), but if you order it vegetarian they do not bring the lumpia unless you ask for it. I will admit to having ordered pad thai quite a few times not because I was craving it, but because I wanted the soup that comes with the lunch specials (and the lumpia is good also). Pad Thai has been my favorite dish from the lunch menu, but I cannot say it is the best because I have not tried all the others. I do think, though, that the pad thai at Singapore Café is better than average in the universe of American Thai restaurants. This is a white to slightly brown colored dish that I was told is made with vinegar and soy sauce. The regular (non-vegetarian) version is also made with fish sauce (nam pla), and personally I think it needs the fish sauce to have the full flavor that it should. Some restaurants use tamarind sauce that turns the noodles a red color, but Becky does not (perhaps this is why I like Singapore’s version better than others). Bean sprouts provide substance but not much flavor, and are traditionally included in the dish. Crushed peanuts are spread on top, and fresh limes and chiles are provided on the side for extra flavor. 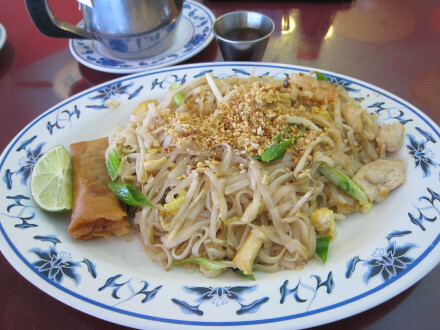 While many dishes at Singapore Café seem to be too sweet, the pad thai is not. Scrambled eggs are mixed in, and it is topped off with shrimp and chicken. The shrimp and chicken are both good, and some tofu is included as well.